Madame Speaker, I am grateful to God and to the people of this Territory for giving me the opportunity to deliver the first Budget Address in the new term of this Administration. The Budget before you is a continuation of the last few years, although it is the first in this term. This Territory's electorate, in an overwhelming show of support, has granted my Government a fresh mandate to continue the work we started in 2011. I take this opportunity to thank the people of these Virgin Islands and to pledge my Government’s commitment to faithfully serve you. Madame Speaker, permit me to refresh your mind as to the state of the world and the BVI when I stood before you one (1) year ago. Despite existing regional and global health issues and the escalating threat of terrorism, the world was easing out of a recession. At the same time, the Organisation of Economic Co-operation and Development (OECD) G20 countries were focused on the tax planning practices of their citizens, and money laundering and terrorist financing became issues of significance, and compliance became more of a household word. At home, we took steps to address the Territory’s ageing or non-existent infrastructure, which we saw as the foundation upon which its future development would sit. Accordingly, we gave investments into this infrastructure the highest priority. We also contributed to the Reserves which now stand at Forty-Nine-point-Eight Million Dollars ($49.8M) to allow us a greater level of autonomy within the Borrowing Guidelines agreed with Her Majesty’s Government. We were completing the new hospital, which was opened in December of 2014, at a total cost of over One Hundred Million Dollars ($100M). The extension of the Cruise Pier and the development of the Pier Park were in full swing. We started the mini-hospital on Virgin Gorda at a cost estimate of Six point Five Million Dollars (6.5M). We completed the actions precedent to forging ahead with the BiWater contract for sewage treatment and water production. We started the largest public works in the history of the Territory by improving our roads, sidewalks and bridges. We opened an office in Hong Kong to protect our market share in the Far East, and we continued our investigations into the extension of the runway at the T.B. Lettsome International Airport. Madame Speaker, these initiatives required a significant allocation from the National Budget. They were deliberate; they were costly, but necessary, and you would agree with me that it was money well spent. That is how we have chosen to use some of the revenue paid into the Treasury, and I dare anyone to say that this money was wasted! Madame Speaker, for the year 2016, we expect revenue in the amount of Three Hundred and Thirty Million, Eight Hundred and Forty Six Thousand, Five Hundred Dollars ($330,846,500.00). You will note, Madame Speaker, that this sum is no smaller and is, in fact, larger than the annual revenue that we have been collecting for the past years. Notwithstanding this evidence, there are those who would make you feel that Government has no money. But that is not the point here. The point is that the demands being made on that revenue stream are greater than ever. But let me assure you that our revenue stream remains intact. 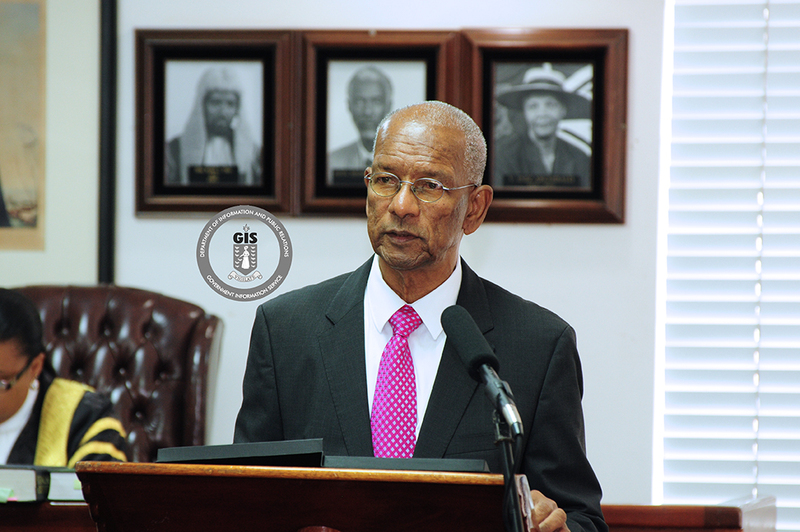 Madame Speaker, when I reported to the people of the BVI last week in this Honourable House on the Consolidated Fund, its cash balances stood in the region of about Six Million Dollars ($6M). As an operating account into which funds are transferred, its balances are never constant, rising and falling as cash comes in as revenue, and cash goes out as expenditure to pay our bills. However, it is important to note that it does not tell the whole story. As of the end of the same week when combined with the Development Fund, Reserve Fund, Emergency Disaster Fund and others, and excluding cash receivables from the Financial Services Commission, the Government of the Virgin Islands had, on hand, over Seventy-One Million Dollars ($71M) in cash assets. Certainly, this is not symptomatic of a broke government but, instead, one that is very diligent in its segregation of its cash assets and is making responsible, prioritised decisions about the use of these assets while facing unprecedented demands on its revenue streams. Central Government, itself, will contribute Forty-Two Million Dollars ($42M) in this year 2016 to expenditure on health care. We will have high expenditures on the extension to the runway at the T.B. Lettsome International Airport, as failing to do so means that our industries, especially tourism, would suffer. We will continue with the expenditures for roads, for water and for our sewerage systems, and we are also proceeding with The Phase Five Development of the BVI Electricity Corporation. Taken together, this means a higher standard of living for ourselves and our ability to offer our visitors and trading partners the high level of services and amenities that they expect. Madame Speaker, these are the kinds of decisions we make about the revenue we collect. Madame Speaker, the National Health Insurance Programme, which took effect last month, ensures that everyone in the Territory, regardless of their ability to pay, has access to health care. This has been several years in the making and has spanned more than one administration. With your permission, I will return to this important subject a bit later on. I am sure that you appreciate, Madame Speaker, that we have done all this while the global economy has been under severe pressure, while oil prices have been falling to their lowest levels and while stock markets have been volatile. We have also been fighting hard to defend our Financial Services’ Industry, which has been challenging at times due to capricious and arbitrary demands and the continued shifting of the goal post on a playing field that is NOT level and, perhaps, may never be. Within the last year, Madame Speaker, we have seen layoffs in the Tourism Industry and the pending temporary closure of one of our major properties. These events are of grave concern to my Government, because they threaten to undermine some of the promises we have made for the future prosperity of these Virgin Islands. But we will not be deterred from our overall goal of improving the livelihood and wellbeing of all of the people of this Territory. Madame Speaker, today we continue on the path of economic growth with “Shared Sustainable Growth” as our goal. It means that everyone, across the entire spectrum of this society, must have an equal opportunity to participate in the expansion of the BVI’s economy, staying true to the principle that, as the tide rises, all sea worthy boats should rise together and grow together in maturity of thought and shared responsibility. Madame Speaker, I am firmly committed to improving the quality of life of every citizen of this Territory. Hard decisions must be made about how we use our scarce resources. We must employ all efforts to do the greatest good for the greatest number. This is the essence of responsible government. Step #1 in this quest is that both sides of the aisle in this Honorable House have a duty to instill confidence in the people of this Territory. As we conduct the people’s business, we must act with kindness, transparency and commitment to their advancement, and that of the BVI. We must consistently work towards ensuring accountability and promote fairness and integrity. As Members of this House, we are not here to ‘act’ for the cameras and to score cheap political points. Rather, our duty is to improve the lives of the people we serve and create a governance framework that allows the Territory to progress. When BVI does well; we all do well! Madame Speaker, I am duty bound to ensure the continued development of a professional Civil Service that serves the people of this Territory and supports elected officials in a non-partisan manner. As more demands are placed on Government to provide services of a higher quality, Civil Servants need even higher levels of preparation and training. Their continued improvement is important to the advancement of the people of the Virgin Islands. To achieve and share sustainable growth then, we must have a shared commitment by each and every citizen of this Territory and the willingness and commitment of its leaders to civil protection and empowerment of the people. In our schools, the song is taught to students, and a generation of BVIslanders and residents are growing up singing ‘O Beautiful Virgin Islands’. This simple act binds them together in kindred spirit, a common hope and a shared identity. It also sows the seed of community which must germinate and become strong trees of community advocacy and protection and which will support initiatives, like the one we tout today, of a SHARED SUSTAINABLE GROWTH. The second step, Madame Speaker, in achieving that shared sustainable growth, is for us to continue with our infrastructural and other social programs for the BVI to be competitive on the regional and global scale and maintain and improve the high quality of life we enjoy. Earlier, I made reference to the National Health Insurance Programme. Health care, in many parts of the world, is based on the individual’s ability to pay. Those who can pay the most get the best quality of care, while those who cannot afford to pay, no matter how desperate for medical attention, are left in a state of poor health and hopelessness. This will NOT happen with my Government at the helm, and certainly NOT under my watch. Therefore, if making this tough decision, ensures that everyone in this Territory has access to high quality health care, then that is what I feel duty bound and committed to do. Under the National Health Insurance Programme, every citizen of the BVI now has access to high quality health care, regardless of their ability to pay. This, Madame Speaker, is the most significant advancement in our civil protection network since the introduction of the Social Security System, some thirty (30) years ago. There will be teething problems that must be faced and overcome in its infancy, but the success of NHI is mandatory for the future shared and sustainable growth of this Territory and the security of its people. I would like to publicly thank the Minister of Health, and his support team at the Ministry of Health and Social Development, and the Health Services Authority, for delivering on the National Health Insurance Programme. I feel a special debt of gratitude to the Social Security Board and the private sector for their tireless and committed efforts. I also thank the former Government for the work they did in advancing the Programme based on the blue print we left when we demitted Office in 2007. Taken in concert with our state-of-the-art hospital and its dedicated and professional staff, I am confident that the health care needs of all of the people of the BVI will be met. I am, particularly, proud of the progress being made with the construction of the Nurse Iris O’Neal Mini Hospital in Virgin Gorda which, on completion, will be a fully staffed medical facility. No one must be left behind! Next week Tuesday afternoon we expect to formally open our Cruise Pier and Pier Park facility. Much has been said in this community about the Eighty-Two Million Dollars ($82M) spent on this project. As I announced about two weeks ago, a I have commissioned an independent international firm to carry out a full audit of this expenditure. The findings will be carefully reviewed and made public. Included in the Eighty-Two Million Dollars ($82M) expenditure is Eight Million Dollars ($8M) that was advanced by Central Government to the BVI Ports Authority. While I have no intention of interfering in the audit, I must make it quite clear to the public that the BVI Ports Authority and the ports for which it is responsible are wholly owned by the Government of the Virgin Islands as are ALL of our Statutory Bodies and Companies. Advancing monies to our Statutory Bodies, when necessary, is, therefore, par for the course in ensuring their survival. Madame Speaker, the Cruise Pier and Pier Park Facility has already proven its value to our growth and competitiveness in tourism. The subsector has been the lifeblood of an important and growing group within the Territory. Taxi drivers, tour operators and tour guides are important to the enhanced tourism model in the Territory. I am also especially proud of the involvement of the BVI business community in this project. Last Saturday, I was in the area of the Pier Park, as they were at various stages of preparing for opening on the 16th of February, their sense of excitement and anticipation of increased business was almost contagious! We expect that the improvements to our tourism infrastructure will not only help to sustain and grow our tour, taxi and commerce but will provide new employment opportunities and provide for more long term land or sea visitations, but they will also provide for the revitalisation, development and exhibition of our culture, proud heritage and historical sites. The significant number of historic sites scattered throughout these islands is proof enough that BVI has a story to tell. And, we will tell that story for the benefit of our visitors and continue to construct the tapestry of national pride in our people. The historic agreements with Disney and Norwegian cruise lines and development of our cruise tourism infrastructure will ensure sustainability in our Cruise Tourism Sector. Yet, Madame Speaker, the development of cruise tourism is but one part of our efforts to develop our very important tourism infrastructure. You will recall that, about four weeks ago, I announced a partnership forged between BVI Airways and the Government of the Virgin Islands to have direct flights between the mainland United States and our main airport, the T.B. Lettsome International Airport. The impetus of this partnership is to begin to release this Territory from the strangle-hold of restricted air access which we currently face, and which in the past several years severely compromised our tourism and Financial Services sectors. Just as importantly, it also made it very inconvenient for our people to travel abroad from the BVI. The move to partner with BVI Airways will cost Seven Million Dollars ($7M) over a three- year period. We believe that this additional investment into improving the quality of life of the people of the BVI and into the continued success of the economic sectors that support us is well placed. As I announced, we expect this service to commence this Fall. And, you will agree with me that, it will be money well spent. The second initiative is of a longer term, more sustainable nature. It concerns the extension of the runway at the T.B. Lettsome International Airport to accommodate jets of the size the 737- 800 and Airbus 320; both aircraft types are the workhorses of the major air carriers serving the Caribbean from the continental United States. This extension will also ensure that the movement of private jets to and from the Territory will be much improved and enhanced. I am, therefore, pleased that within six months, and barring any insurmountable unforeseen circumstances, we will be in a position to ink a contract for the expansion of the T.B. Lettsome International Airport. Madame Speaker, that is good news, and you would be aware that this project remained high on my Government’s agenda since we assumed Office in 2011. Unfortunately, because of the need for certain levels of approval from Her Majesty’s Government, the need to ensure that international procurement standards are strictly adhered to and the need to sequence our programs in a manner that will be affordable, the time for this project execution was delayed, until now. I am grateful to the Minister for Natural Resources and Labour and Deputy Premier, under whose Portfolio this subject falls, for his persistence in getting us to this stage. This project, and the scheduled direct flights later this year to Miami International Airport, constitutes the first and second phases of a “game changer” here in the BVI’s economy. Unlike the previous incidence where a similar venture such as this one required a refueling stop in the Turks and Caicos Islands, this is the first time in recorded history that we will have direct uninterrupted commercial flights between the British Virgin Islands and the continental United States; and, more importantly, easy and quick connections to and from all major airports. These two related improvements to air access will pave the way to greater investment in our Tourism Industry through building additional high-end properties as well as allowing for further diversification of our Financial Services. Madame Speaker, from day one of my Government’s return to office in 2011, we realised that the principal challenge confronting the Territory and my administration was that of transforming our economy into one that is globally competitive; an economy powered by ‘best in class’ services in tourism and Financial Services, reflecting the needs and demands of the global marketplace, one that is capable of delivering, over the long term, the resources and opportunities required to keep building a modern BVI where we are able to successfully expand the quality of life for all of our citizens. Madame Speaker, this is the bedrock of our economic agenda. To move this agenda forward and deliver the benefits for our people in multiple areas Madame Speaker, we have adopted an aggressive holistic development strategy across all ministries, departments and statutory boards of the government. A strategy that has no parallel in our recent history, and one that I am aware, is at times a little overwhelming for some, but Madame Speaker, one that is absolutely necessary for the future success our children and their children. Madame Speaker, as Premier and Minister of Tourism, another area that I am paying very close attention to, is the overall management of the sector. Here my concern is that as a destination we deliver on the experience our visitors demand, an expectation in all sectors; cruise and overnight, We must keep our eyes on this ball at all times. We must ensure that we balance the needs of all sectors in a harmonious manner. Madame Speaker, I am fully aware that we face challenges in some areas with overcrowding in some of our more popular sites, as well as the need for additional facilities. Some work has been done but much more remains. This budget will see the continuation of the implementation of our tourism infrastructure project which will be spread over the next three budgets. I must commend the work done by the Director of Tourism and her team at the BVI Tourist Board in putting this detailed plan together. I look forward to the same level of energy as we move to the implementation phase, and am expecting great things from our Junior Minister for Tourism Honourable Archibald Christian as he moves this agenda forward. Madame Speaker, tourism is clearly on the move again. Madame Speaker, in the past year besides investing substantially in improving roads throughout the Territory, we have expanded our water distribution network and completed modern and adequately sized sewerage treatment plants at Burt Point and Paraquita Bay. These basic improvements are essential. I accept that there has been some degree of inconvenience such as dusty roadways, slowing of traffic and the like but as we can see its all for the greater good of this Territory. In addition, and recognising the essential role that reliable and fast telecommunications plays in the BVI’s ability to thrive and compete, we have facilitated the telecommunications providers' abilities to expand and improve on the capacity of their systems, with the expectation that very soon we will have unprecedented telecommunications capability at an affordable cost at the fingertips of all residents and citizens of the BVI. I thus am very grateful to the Minister of Communications and Works and his ministry for his leadership and tireless commitment in developing and improving the physical infrastructure of the Territory. To maximise the potential of our citizenry our people must be educated; from the cradle right on through adulthood. And even then, we cannot afford to rest on our laurels since the business of Excellence, in which we are engaged, is the work of a life time and the work of generations. We will, therefore, stop at nothing to ensure that our educational system is par excellence, and provides for the needs of the BVI economy today and into the future. In doing this we will ensure that our youth have the opportunity to be occupied in activities that develop their athletic and intellectual abilities as well as building character as they grow into well balanced, responsible and civic-minded stalwarts of our society in the years to come. Madame Speaker, we take a very futuristic approach to governing this Territory and, therefore, provide every possible opportunity for the development of our young people. That is why we have restructured the Department of Youth Affairs and Sports and launched the Youth Parliament to expose the future leaders of the Territory to the parts played by governance and diplomacy in nation building. There is much in store for our youth, including bringing technology to their classrooms and, very significantly, beginning with Elmore Stoutt High School, separating the junior and senior schools. You will be hearing more about this in the coming months. Madame Speaker, without tertiary education, we can no longer be the masters and architects of our Territory. We currently have some two hundred and eighty-eight (288) students on scholarships in various Universities and Institutions of higher learning around the world, and we continue to forge important links through our own H. Lavity Stoutt Community College to ensure that we also have high quality education and training opportunities for our people at home. All this carries a cost, and Madame Speaker, it is a cost we are prepared to pay, but, going forward, we will do so on a prioritised, competitive basis, funding only through scholarships, those areas that support our current economic sectors and the future development of the Virgin Islands’ economy. The Minister for Education and Culture has been doing a tremendous job in moving this mandate, and I would like to recognise him for a job in progress; and a job, well done. Thirdly, Madame Speaker, we also must continue to protect and enhance our resources, whether they are our natural, physical endowments of these islands or our most prized and valued resource, our people. We have done many things to safeguard our environment including the policy on the protection of sharks and rays, our commitment to the Climate Change policy debate, the starting of the climate change trust fund and the policies surrounding it, as well as proactive and sensitive interventions in regards to the labor market itself. As the environment goes, so go the people of the BVI. So it is both from a sense of duty as well as survival that we are bullish on the protection of the environment. We are particularly concerned about the pending, temporary closure of the Little Dix Bay Hotel and the adverse effects that this will have on the lives of its dedicated and committed employees, many of whom have provided high quality service to visitors and residents alike for decades. We are equally concerned about the knock-on effects of this temporary closure in, especially the Virgin Gorda community as well as to the wider economy of the Territory. I can promise you that I will do whatever is possible for us to help our people through this trying time and to ensure that the hotel reopens within the timeframe stipulated by its owners. The increasing competition in our tourism and Financial Services sectors. But, the BVI cannot stand still, while global business is transacted at the fast pace that has become the norm in today’s world. And if ever the old adage was true, it is in today’s world, YOU HAVE TO SPEND MONEY TO MAKE MONEY. Take, for example, our fishermen, Madame Speaker. We invested in the BVI Fishing Complex. They now have a reliable market for their catch, three hundred and sixty-five days (365) a year, and they are being taught innovative ways to ensure its sustainability. We have also done our part, in this regard, Madame Speaker, by mandating closed season on various species which enhance their survival and the sustainability of the livelihood of our fishermen. Madame Speaker, I have always believed that the true developmental capacity of the BVI lies in the fiscal entrepreneurial spirit of the individual. Equally, my Government has always maintained that we would never unfairly burden the people of this Territory, in direct taxes, because of increasing demands on the public purse. This has not been our track record. In fact, as you will recall, it was my government that erased the income tax system where you paid as much as twenty (20%) of your income in direct taxes, and it is my Government that gives the first Ten Thousand Dollars ($10,000.00) of your income as a tax free benefit to you and your families. So, I know you have not been slow in understanding, Madame Speaker, that when we propose initiatives that require everyone to make a contribution to a shared sustainable development, we do so only after weighing the balance and determining that the greater good rests with the people. That is certainly the case with the National Health Insurance Programme, and it is the case with some increases which I will be proposing for the coming years. Madame Speaker, the year 2016, represents a shift from the expectation that there will always be a windfall that will provide for unplanned events. We must, going forward, plan very carefully to ensure our survival. During those years when our revenues outstripped the public expectation and demands, we lowered the individual tax burden. When Financial Services grew at a rapid and unprecedented rate, we did not hold back in providing the services demanded, including free education at the HLSCC. But now, based on challenges in the international community, we have not been able to achieve, in the past few years, what we have been accustomed to achieve. Despite this, however, the public demands and the demands of our visitors and the international regulatory community have grown. This means that new revenue streams are needed to handle our commitments and obligations. We have to change our old way of doing things if we are to survive. So, Madame Speaker, while the pundits proceed to advise on what they never implemented when they had the opportunity to do so, my Government will be busy building our institutions so that constitutional advancement can be a reasonable expectation and good governance, transparency and full accountability of our leadership now, and into the future, will be the manifestations of our work. So, given the hand that we have been dealt and the cards we have deliberately chosen, my Government has performed credibly, honestly and well, and we have conducted your business in a manner that sees this Territory better off under our administration. Consequently, Madame Speaker, we expect a conservative year in 2016 but, expect that, in 2017 and 2018, this picture will get progressively better, as various measures that we are taking to raise revenues begin to take effect. This year is but the first of our four-year term. 4.Continue a more aggressive approach to the collection of current taxes and fees and arrears, by reviewing current legislation to give revenue collecting agencies greater authority to enforce compliance. These measures and others that I have not indicated here, but will expound on in another forum, cause us to expect to yield up to some Twenty point Five ($20.5M) Million Dollars in additional revenue in 2016.
Review and revise the current stamp duty regime. Our expectations are, that in combination with the measures taken, we are projecting total additional revenue of Twenty-Six point Two ($26.2M) Million Dollars. We further intend to, introduce an environmental levy and to harmonise the existing fee and tax structure for hotels and yachts, to review and revise the current marine fee structure by consolidating existing fees and creating a collection system that is fair and easy to monitor. To be clear, Madame Speaker, these figures represent an additional intake that is forecasted over what we would have otherwise received without the revenue measures. Madame Speaker, before dealing with the specifics of the budget, there are a few points I must make about our Financial Services. I started out this address by describing the direction in which developed countries were headed, as it related to Financial Services a year ago. Madame Speaker, the scrutiny I mentioned has intensified manifold. Be that as it may, as a policy, this administration has remained actively engaged with all our international partners, as it is our philosophy that it is always better to be sitting at the table than being on the menu. Madame Speaker, I am delighted to report that today this Territory has again met the international standard in tax transparency and exchange of information having passed Phase 2 of the OECD Peer Review with flying colours. Late last year, we were also removed from the French Black list. Thus, the positive image of this jurisdiction is even more enhanced. From time to time, I have also reported to this House on our negotiations with HMG and with Prime Minister Cameron, more specifically, to whom we have committed our support for his Agenda of Tax, Transparency and Trade as far back as 2013. We continue to be proactively engaged on these issues and have made significant progress towards meeting the requirements that would be mutually satisfactory. As the global community continues to be less accommodating of International Finance Centres, the BVI must redouble its efforts to re-establish and maintain itself as the best place to do legitimate cross border business. The all hands on deck approach, required to achieve this, is already bearing fruits. The aim here will continue to be strengthening the BVI Financial Services Sector’s value proposition making it a more competitive, more efficient, more customer centric, and a more compliant jurisdiction, offering an eclectic array of diverse solutions to the myriad challenges that confront cross border business in today’s increasingly globalized world. Madame Speaker, in this vein, I am pleased to report that our efforts to position the BVI as a player in the international arbitration space have gotten off to a promising start. The newly established Board for the Arbitration Centre has already recruited a new CEO and has set itself to having the Centre outfitted and up and running before the end of this year. Similarly, evidence suggests that the sterling efforts of the industry, government and the regulator, to make the jurisdiction more competitive within the Investment and Hedge Funds arena are already paying off. I am advised that the recently launched New Incubator Funds and Approved Fund Managers regimes are gaining a lot of traction and interest within the industry. This augurs well for the revitalisation of our funds industry in the years ahead. Later this year, it is expected that efforts will intensify to develop a special European Union Compliant Fund that would qualify for pass porting throughout Europe. In the arena of Intellectual Property, the implementation of the new state of the art Trademarks Act, which has brought our trademark activities from the analog world to the digital world, has resulted in a steady flow of applications for the registering of Trademarks’ and Trademark Agents. Work is expected to begin on new Patents and Copyrights Legislation to strengthen and completely modernize our suite of Intellectual Property Laws. Madame Speaker, the comprehensive, resource intensive and daunting National Risk Assessment (NRA), currently being undertaken to help us prepare the BVI for its Financial Services 2017/18 round of mutual evaluations, is nearing completion. This NRA exercise is a vital component of the jurisdiction’s arsenal for ensuring the sustainability of the industry upon which the fortunes of our country so depend. It is expected that the NRA will result is a suite of recommendations that, if accepted and implemented, will consolidate the BVI as a stable, credible and trustworthy centre for doing business. It will further ensure the readiness of the industry, the government and the regulator, not just for the realities of the challenges which confront us today, but also for those challenges for the foreseeable future landscape. So yes, Madame Speaker, the Financial Services sector is truly a global sector; it knows no borders. In this dynamic, highly competitive and highly mobile sector, being complacent and resting on our laurels cannot be an option. Global financial standards and best practices continue to evolve and emerge, but it is our collective efforts that will be the key to maintaining our competitive edge. Let us all together, government, industry and the regulator, respond appropriately to instill public confidence and the development of a lasting, compliant, competitive and vibrant Financial Services sector where expert knowledge, professional conduct, ethical behavior and customer centric ethos is the operating norm for the benefit of the BVI. The residents and citizens of these islands demand and deserve nothing less! Madame Speaker, we have surmounted some of the key challenges which we were facing in Financial Services. As we look towards building an even greater sustainable industry, there is much work to be done. We are well on our way with the implementation of the Financial Services Consultancy Report, commonly referred to as the McKinsey Report, which was approved in this Honourable House in February 2015. We have established a dedicated Unit, the Financial Services Implementation Unit (FSIU), to implement the Report’s ten (10) priority recommendations over a two-year period. The FSIU has been making significant progress under its BVI Forward branding. We are also, with the assistance of the Initiative sponsors, developing specific Action Plans to make the changes necessary to secure the future of the Industry. Some of the more notable areas of progress include plans to establish BVI Finance Limited as a public-private partnership company, to bring our marketing and business development functions on par with our competitors and to revamp the Financial Services Institute into a private sector focused body to ensure it is preparing our people for the emerging sectors of the industry that we are targeting. In the coming weeks, these matters will be placed before Cabinet who will also address many long overdue changes to significantly improve our Work Permit processes with reforms to both Labour and Immigration. During this year, Madame Speaker, we will continue to strengthen and reposition the Financial Services Sector with various initiatives through this Unit and, at a later date, I will bring these forward for review. I expect that these initiatives will help us, Madame Speaker, to improve our offerings in the Financial Services Industry and secure the future of the BVI. I am particularly grateful to the Financial Services Industry, here and internationally, for the support that they have given my Office as we seek to reposition our Brand in keeping with the recommendations of this important Report. Going forward, our promotional focus will continue to include many of the BRICS countries (Brazil, Russia, India, China and South Africa). Madame Speaker, on the international front, we cannot ignore the vagaries of the global economy and its impact on this Territory. Let us, for example, consider China. The poor performance of the Chinese currency (RMB) has, in recent weeks, affected stock markets globally. Given the trading relationships that this Territory has had with China for over thirty (30) years, we must keep our eyes on these developments. However, Madame Speaker, our Asian programme continues to be critical to the Territory’s overall success. Notwithstanding the present, sluggish outlook, especially in China, Asia is still the world’s fastest and most vibrant economic region with the largest GDP growth, according to the World Wealth Report 2015. We have to protect our position in that region and grow our market share. So, in 2016, BVI House Asia will ramp up its operations by strengthening governmental and business relationships while promoting investments, business partnerships, professional, educational, tourism and cultural exchanges. With more direct access from the US mainland, we will be in a position to promote the BVI as a tourism destination in China and to solidify partnerships in building on our Shipping Industry. Relatedly, we will encourage transshipment as a new business venture. Yes, Madame Speaker, this is an ambitious agenda for BVI Asia, but a necessary one. On the question of Trade, Madame Speaker, you would have heard me stress in this House many times over the importance of businesses and entrepreneurship in developing our economy. In 2016 and beyond, we will focus heavily on our Trade and Investment Portfolio in which we have already made significant progress. We have renamed and rebranded the Department as the Department of Trade, Investment Promotion and Consumer Affairs. We have expanded the Department’s mandate to focus on Investment Promotion, which we intend to exploit heavily in 2016 and beyond as we seek to expand the economy of the BVI through local and inward investments. Trade will also focus on reforming its trade licensing process to achieve greater efficiency, transparency and policy reform, all of which are necessary to ensure a strong and thriving business sector. We will also advance the long overdue consumer protection platform in the Virgin Islands. These and other initiatives in Trade rest on the competent shoulders of our Junior Trade Minister, Honourable Marlon Penn. Madame Speaker, I expect great results and thank him in advance. In respect to the budget for 2016, we anticipate to bring in some Three Hundred and Thirty Million, Eight Hundred and Forty-Six Thousand, Five Hundred Dollars ($330,846,500) in revenue, with recurrent expenditure in the region of Two Hundred and Eighty-Six Million, Five Hundred and Twelve Thousand, Four Hundred Dollars ($286,512,400). With the resulting recurrent surplus of Twenty-Nine Million, Three Hundred and Thirty- Four Million Dollars ($29,334,000) we expect to meet debt service obligations on our existing loans to the amount of Twelve Million, Four Hundred and Eighty-Four Thousand Dollars ($12,484,000). We will fund much of our developmental projects from loans that we have approved over the last two preceding years in addition to some funding from the Consolidated Fund to the amounts of Twenty-One Million, One Hundred Thousand Dollars ($21,100,000) and Twenty Million, Five Hundred and Fifty Thousand Dollars ($20,550,000), respectively. Madame Speaker, this we will do while contributing another Fifteen Million Dollars ($15,000,000) to the Reserve Fund, bringing it to over Sixty-Four Million Dollars ($64,000,000) in 2016. This means we will meet our requirement under the Protocols for Effective Financial Management by the end of the 2017 financial year. In 2015, we engaged the United Kingdom in discussions with a view to grant us leave to relax the previously agreed deadline to meet the 2015 reserves ratio agreed to in the Protocols for Effective Financial Management. We decided that this requirement could be extended to 2017 in order to facilitate an aggressive Capital Investment Program. Madame Speaker, the 2015 – 2017 Medium Term Fiscal Plan bears this out as does the 2016 – 2018 Medium Term Fiscal Plan. Madame Speaker, our future continues to depend on our ability to meet the challenges as they present themselves and to adapt, but to do so, without losing our uniqueness. Madame Speaker, I have taken some time today, and have in the past five Budget Addresses, to outline to you the building blocks of a society that we are building, but I have not yet indicated what I envision for us as a Territory. Madame Speaker, in order for us as a people to realise our full potential, our goal must be self-determination, but we must do our work now and grow in maturity as a people. I envision a society that is environmentally friendly, our capital and main town is clean, the internet is freely accessible to anyone within its boundaries, our infrastructure meets and exceed the needs of our people and visitors that come to our shores, where our children and senior citizens are protected and taken care of and where crime is nonexistent. Madame Speaker, that is my vision for the BVI, and I will do everything in my power to put us on the path to getting there. In this context, Madame Speaker, there is an often unheralded facet to why we are able to thrive in the BVI. It is the rule of law and our relatively low crime rate. Madame Speaker, I invite you and all the residents of the BVI to consider very carefully that the industries from which we earn our livelihood - Tourism and Financial Services - are not compatible with crime. I am fully aware that the hard working men and women of the security organizations, led by the Police at the forefront, with Customs and Immigration on border control, backed up by the Financial Investigations Agencies and the Courts, are doing a wonderful job to keep us safe and protected. We thank them from the bottom of our hearts for the jobs they perform and pledge to provide them with the support they need to continue to operate efficiently and credibly. Madame Speaker, there is a bright future ahead, but I make no promises on it being an easy road to get there. It will take commitment to country and selfless sacrifice for the betterment of the community, in general, to get us there. I urge each and every one of us, as citizens of these beautiful and very special Islands, to work as a community to ensure our future and that of our children. Madame Speaker, I would like to close by thanking the people of the BVI who have worked tirelessly over the past year to make their contribution to the development of the Territory. To those who have not done so, for various reasons, I would like to encourage them to do so, as part of a community that depends on each other for its overall success. To our security and enforcement services, I extend to you, on behalf of the people of these Islands, a deep and sincere thank you for a job well done. It is because of your tireless work that our people can move around in relative safety and, despite the challenges you face, you continue to strive for excellence. To the private sector, in whichever arena you function, we are most grateful for the contributions that you give. I am encouraged to know that you have found it worthwhile to build businesses in this community. To the public sector, the Territory is in your debt as you provide service to the people of the Territory continuously and without fail. To my colleagues here in the House of Assembly, on both sides of the aisle, and to their families who support them in this mammoth task of leadership, I say a heartfelt thank you. And, finally to you Madame Speaker, for your leadership and guidance here in this House over the past year, as you facilitated the people’s business and promoted fair play throughout its proceedings, I say ‘thank you’, and ‘God Bless you and these Virgin Islands’.